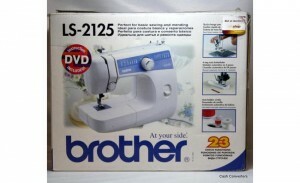 Are you interested in buying the Brother sewing machine LS-2125? The lightweight, user friendly Brother LS2125i is a beginning sewer’s dream. It is a nice simple sewing machine which is to operate, inexpensive and an easy machine for any beginner to learn how to use. This model can accomplish any basic sewing task: making clothing or alterations, , creating home décor items or other fun crafts. Your purchase comes with an easy-to-understand instruction manual so you can be up and running in no time and learning how to wind the bobbin to using the free arm is a breeze. This state-of-the-art sewing machine for beginners has great features not only for beginning sewers but also for those who have been sewing for a long time. Novice or professional, you just have to read up on the LS2125i’s features below to see how these can be flexible to use for most, if not all, of your sewing needs. With ten stitches programmed into the machine, you can do satin, stretch, zigzag, elastic, straight, and blind hem stitches in no time. Buttonholing can be done automatically in four steps and allows you to choose customized buttonholes for specific buttons to fit into. Easily change presser feet designed with a snap on to allow you quick switching from buttonhole to button sewing to zipper feet. 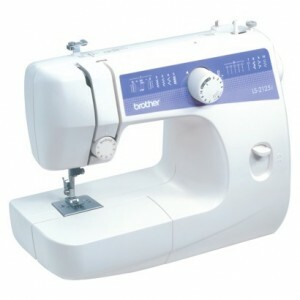 Equipped with foot pedal for controlled operation as well as stitching speed and fast bobbin winding. With a lever for forward as well as reverse stitching. Has an adjustable thread tension, intuitive dial control. Comes with the following accessories (other than the foot pedal): needle pack, additional spool pin, darning plate, screwdrivers, and bobbins that are stored in the storage compartment inside the free arm. Accessory feet include: button fitting foot, zipper foot, and buttonhole foot. Comes with a 25-year (limited) warranty. Customer support by telephone is toll-free. Comes with a bilingual instruction manual in English and Spanish. Has a soft cover carrying handle for portability. Equipped with a free arm that can be used as a convertible flat bed. Heirloom and decorative stitches are also built-in for use. Stitch density is assured equally on each buttonhole’s sides. Decorative stitching is made easy with its twin needle. With built-in lighting for illuminating sewing area. With light switch and safety power. Dimensions: 15” x 6” x 11.8”. Excellent performance for everyday, simple sewing and alterations of clothing, home décor like curtains, table linen, etc. A sewing machine that the owner can grow with while learning sewing techniques. The free arm’s convertible capability helps in the organization of sewing accessories for the user. Its portability allows the user to bring it anywhere conveniently and, because it is lightweight, it is not physically for carrying around. Threading is the most convenient feature of this sewing machine. Even professionals will enjoy the numerous features, as mentioned earlier, of this particular Brother model. Value for money purchase for a sewing machine in its class. Some users have reported problems while sewing because the thread has the tendency to lock on top or under the fabric. Beginning sewers understand that the Brother LS2125i is a basic, regular sewing machine that is not expected to operate like more feature-rich machines like its embroidery cousin the Brother SE400 sewing machine. Most owners we talk to agree that this particular model is an excellent “value for your money” purchase. The affordable price of this sewing machine was well-appreciated by customers who have tight budgets but want a quality machine like the LS2125i. One of my students gave this machine it to her eight-year-old daughter after going through the features and specifications and found it perfect for her child to learn sewing from. Pair this machine with a good beginner sewing book and you’ll be amazed at what you can do. Even people who have been professionally sewing – one for almost 50 years – found this beginner sewing machine just as suitable for their sewing requirements for dresses, pants, and craft projects. If you know someone who is just starting out this machine would be a great choice. Its also very light and portable so its easy to take along to a sewing class (click this). If you are on a budget or don’t need anything overly fancy or complicated, then there is nothing better or more suitable to use than the LS2125i. This is a great choice for anybody who wishes to learn how to sew. If your immediate need, however, is for a machine that can turn out embroidery, appliqués, and the like, another sewing machine model may be the better option. While it is versatile enough for beginning sewers, the LS2125i does not have the features that would allow you to quilt or work on heavy duty projects. Should you buy the Brother sewing machine LS-2125i? Yes. The LS2125i is the sewing machine for those honing sewing skills or mastering sewing basics. It is very affordable for its plethora of features and accessories, easy to operate, portable, and can be used by both novice and professional sewers with the greatest of ease and convenience. Click here to check the availability and pricing for this sewing machine on Amazon.